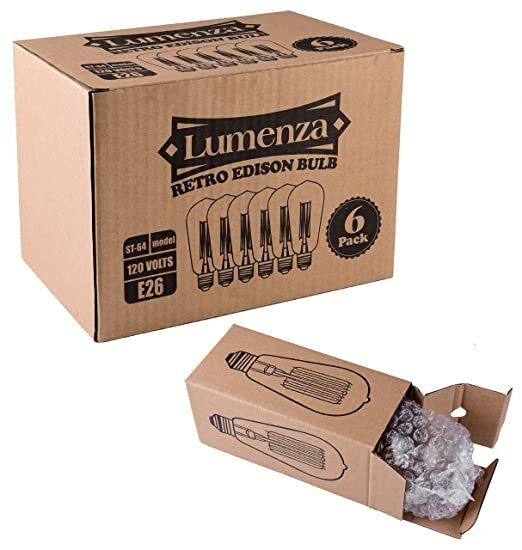 Lumenza Edison Bulbs ST64- 6 Pack- Squirrel Cage Filament Lamps- 60W- 120V- E26 Base- Vintage & Retro Style- Antique Lighting- Suitable For All Household Fixtures, Chandeliers, Lamps & More! You Need To Change Your Decoration... And You Don't Have An Idea About What To Do. Should you change your sofas and tables first? Or your kitchen? Or maybe your bathroom... Alright, that's way too tiring. We have an easier way in order to change your decoration without removing your furniture- think about your home's lighting- just think how much your overall décor would be affected if your lighting was different! And there's where our company comes in. 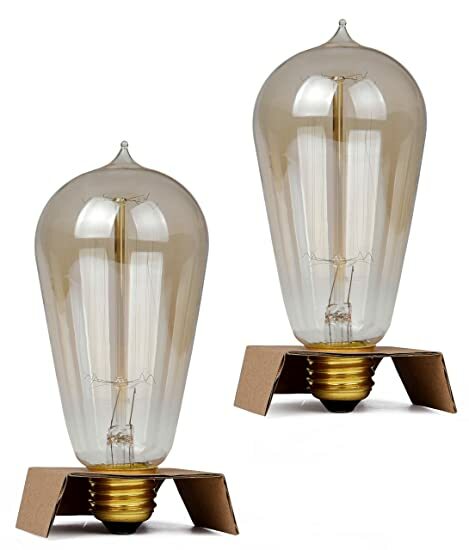 It's going to provide you with a top-notch Edison squirrel cage bulb set that is going to make your day a breeze. Once you install them, you'll feel a vintage mood entering your house just like that- turn your decoration into retro, without excessive effort and hassle! Perfect for a wide variety of home fixtures, as well as chandeliers or conventional lamps- ideal for every room! Your Electricity Bills Will Get Instantly Lower... Indeed- because it's a pity to spend your money on bills, while at the same time you can enjoy high-quality lighting all around your home without hassle. Listen to our suggestion- our 6-pack set of 60W, 120v ST-64 models that features a E26 base for ultimate energy saving- what else do you need? Our lamps will serve you for more than 3000 hours- well, that's a lot of hours, don't you agree? Your Friend Is A Décor Enthusiast. And You Need A Smart Gift... Let us tell you that perfumes, clothes or flowers won't impress him/her. 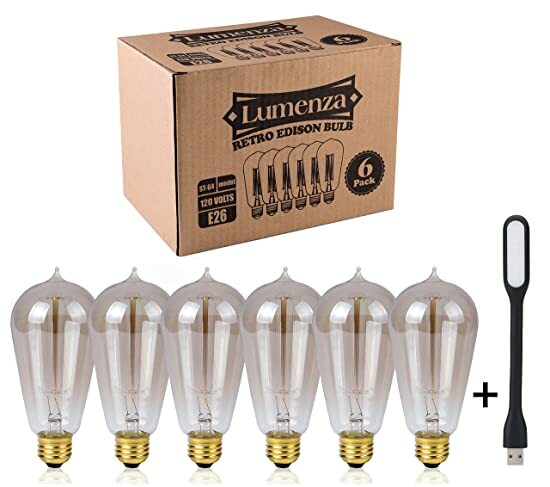 Yet a 6-a pack of retro light bulbs would be great instead... Don't think about it too much- our lamps is just what every interior design enthusiast needs in order to upgrade his/her home design without spending an excessive amount of money. Decorate With Style. Be Vintage. 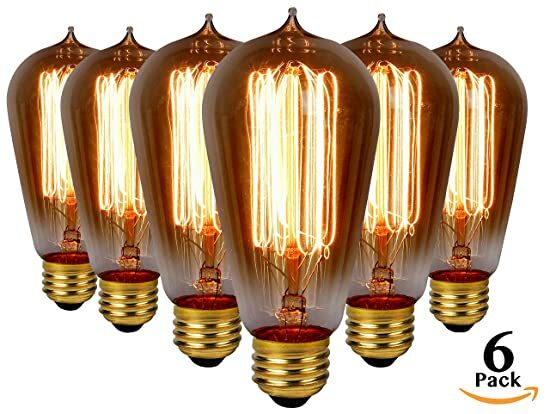 Order Your Edison Light Bulbs Today. THE HIGHEST QUALITY THAT YOU DESERVE: Indeed- unlike other light bulbs that are constructed by poorly-crafted glass, or are prone to scratches and damages, our ones are built to serve you for a lifetime. Forget about lamps that stop working after a couple of times using- our ones will arrive save and sound, and will work like they're supposed to! UPGRADE YOUR HOME DESIGN: Do you love vintage and retro atmosphere and you would like to design your home like that? No problem- all you need to do is to get our lamps and you'll spot the change immediately. 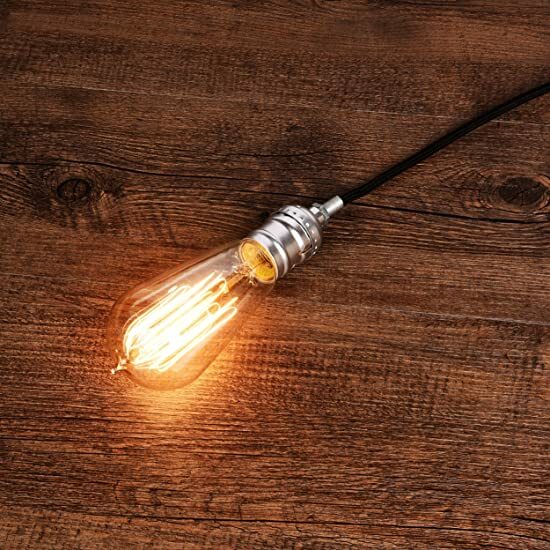 Our Edison- styled bulbs, will transform your decoration and will make you think you're living in another era- what else do you need? PLACE THEM EVERYWHERE: If you're wondering where you should put those squirrel cage Edison bulbs, then we have to tell you that there's no need to worry. Designed to fit everything- place them at your chandelier, at any home fixture, typical lamps, and so on. Perfect for every kind of decoration and for every room of your house. A must-have for every home! SUPPORT YOU FOR THE YEARS TO COME: Sick and tired of spending your money on electricity bills? Our ST-64 model is exactly what you need- because money doesn't grow on trees. Get them now- ultimate energy saving up to 3000 hours! Functionality and design at once- exclusively for you!